Joseph Hill wanted to join his twin brother in the accounting program at the University of Missouri-St. Louis this fall, but he didn’t quite have his act together. That’s why he was glad to hear about the campus’ Quick Admit Day on Wednesday. He was able to get admitted, talk to an adviser, look at possible courses and even take part in orientation if he chose, all in one day. He was one of dozens of prospective students who took part in the inaugural program on the campus, which is trying to bolster its enrollment by signing up more transfer students. That kind of response is the whole purpose of Quick Admit Day, according to Christy Hummel, a transfer specialist at UMSL. She said the campus is always looking for different ways to recruit students, and the lightening round was a good approach to take. 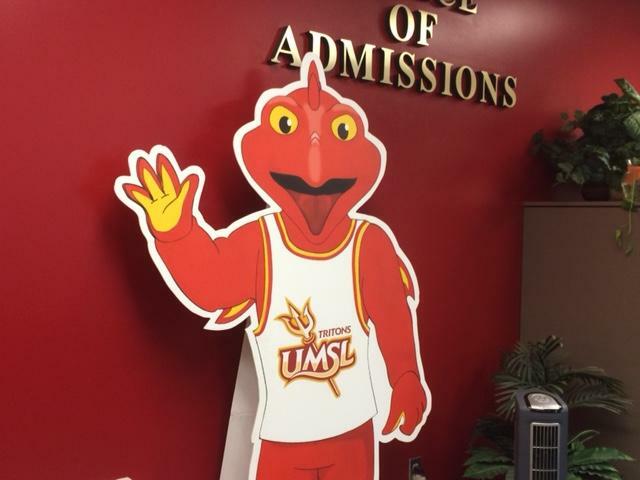 A cardboard cutout of Louie, the UMSL mascot, greets prospective students. Spreading the word on community college campuses, online and elsewhere, Hummel said she had hoped for 50 students to take part. By Tuesday night, 90 had already signed up online. As the morning progressed in room 351 of UMSL’s Millennium Student Center, more chairs had to be brought in to accommodate the growing number of participants. Summer can be a busy time for students who are leaving one school and shopping around for another, Hummel said, and UMSL wants to help ease the transition. Because students have to sign an affidavit that they are submitting accurate transcripts, she said she isn’t concerned that the ones who are seeking an expedited process are somehow inferior to those who follow more standard procedures. After students got admitted and met with advisers, they went down the hall to the Student Life office, where they found university personnel ready to help them with classes and other questions – not to mention a table laden with fruit and cookies. There, Bertha Savala, 24, talked about her plan to enroll in nursing school after earning 60 hours of credit at St. Louis Community College at Forest Park. 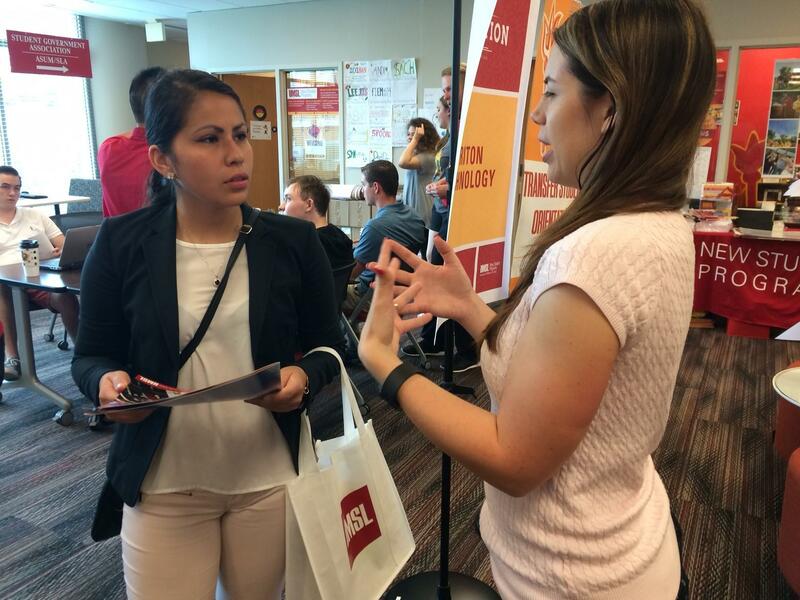 Bertha Savala, left, learns more about UMSL at the campus' Student Life center. Her time at Quick Admit Day confirmed that view, Savala said. The University of Missouri Board of Curators holds the license for St. Louis Public Radio.